This Tablecraft 1474 9" x 6" x 2 1/4" brown oval rattan basket is perfect as a trendy serving option for your signature dishes, or just as an item organizer! Ideal for presenting colorful arrays of delicious fruit, freshly-baked bread, moist muffins, or just about any other shareable menu item, this basket makes a versatile addition to your tableware options. Alternatively, use the basket lined with a soft cloth to make a handy silverware container, creative display for baked goods, or a unique condiment container. From authentic country flair to modern-rustic style, the classic rattan-esque woven look and brown color complements a wide range of restaurant decor. Made from smooth, durable polypropylene cord, the basket has no jagged edges like traditional rattan weaves and provides easy clean up with only a damp cloth and rinsing water. The woven plastic structure of the container provides a heavy-duty build that will stand up to the daily abuse of a busy food service establishment. No matter how you use it, this basket is sure to delight guests with its simplistic, handmade look and sturdy construction. 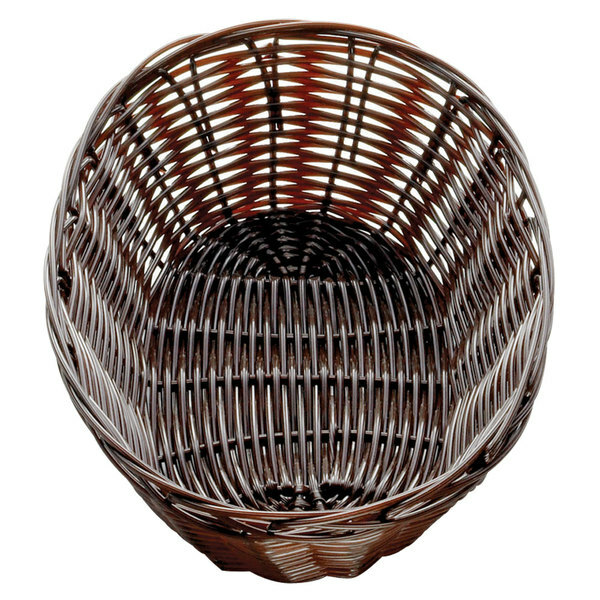 Provide customers with a familiar yet unique dining experience with this brown oval basket! The baskets are the perfect size for crackers and rolls. The baskets are not very deep, but we were able to fit about six rolls and a variety of crackers too. These baskets work great for our sandwiches. Customers are always asking where I bought them and I tell them from this site. These are very hard to find where I live, so it is nice being able to buy them with just a few mouse clicks. this basket is great for bread for a large table or banquet. The dark finish looks great and the structure is very durable. Great Deal!! After a little upgrade we bought these for our restaurant and customers love them! We used to use the reg old paper meal trays and these have gotten a much better response!